Classroom Lecture, Small Group Learning Stations, Practical Testing Scenarios and Written Exam. 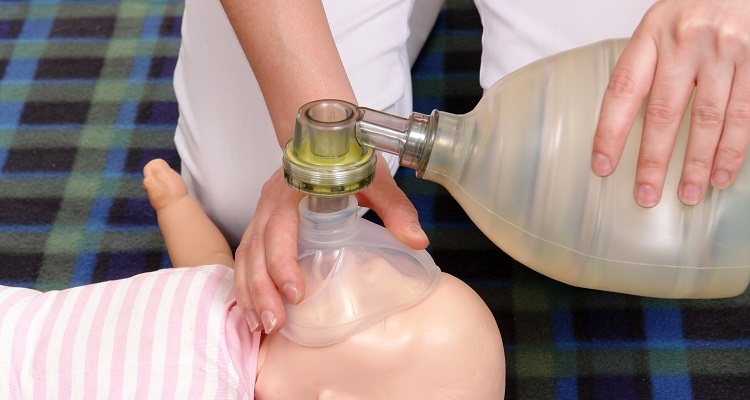 The American Heart Association Pediatric Advanced Life Support course is based on science evidence from the most current AHA Guidelines for CPR and ECC. The goal of the PALS certification course is to aid the pediatric healthcare provider in developing the knowledge and skills necessary to efficiently and effectively manage critically ill infants and children, resulting in improved outcomes. Skills taught in this first aid class include recognition and treatment of infants and children at risk for cardiopulmonary arrest; the systematic approach to pediatric assessment; effective respiratory management; defibrillation and synchronized cardioversion; intraosseous access and fluid bolus administration; and effective resuscitation team dynamics. This course is designed for pediatricians, emergency physicians, family physicians, physician assistants, nurses, nurse practitioners, paramedics, respiratory therapists, and other healthcare providers who initiate and direct advanced life support in pediatric emergencies. Per current AHA program administration guidelines, A BLS CPR card is NOT required for this course, but you must be proficient in child and infant BLS for healthcare provider skills and your skills will be reviewed and evaluated as part of the PALS Provider Course. BLS certification is not included with PALS course registration. Students that are not confident in their BLS CPR Skills should register for a BLS Course prior to attending the PALS Course. Many PALS courses offered through Cascade Training Center include an option to renew your BLS/CPR for Healthcare Providers credential. You may see an option to purchase this as a BLS CPR Online Part 1 w/ Skills Verification. If that option is not available at checkout please call our Customer Support Center at (877) 277-6778 for more information. To find Upcoming PALS classes, please enter your zipcode and click 'Search' below. If you have any questions regarding this class, please contact our knowledgeable staff. Cascade Healthcare Services and the Cascade Training Center is an approved provider of multiple Continuing Education programs. Cascade Training has a robust and experienced team dedicated to quality clinical operations.